We are a leading Manufacturer of hi-chrome slurry pumps from Ahmedabad, India. We are the suppliers of Hi-Chrome Slurry Pumps. • Slurry Pumps are mainly used in Power Plants, Captive Power Plants of Sugar Mills, Fertilizer Plants, Paper Mills, Pharmaceuticals, Refineries. • We are the suppliers of Slurry Pumps. 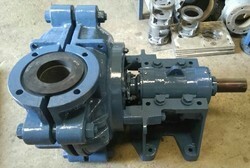 Looking for Hi Chrome Slurry Pumps ?